Comments on this giveaway are now closed. Today I'd like to introduce you to Karen, who stocks her shop Little Wool full of sweet, wool treasures. 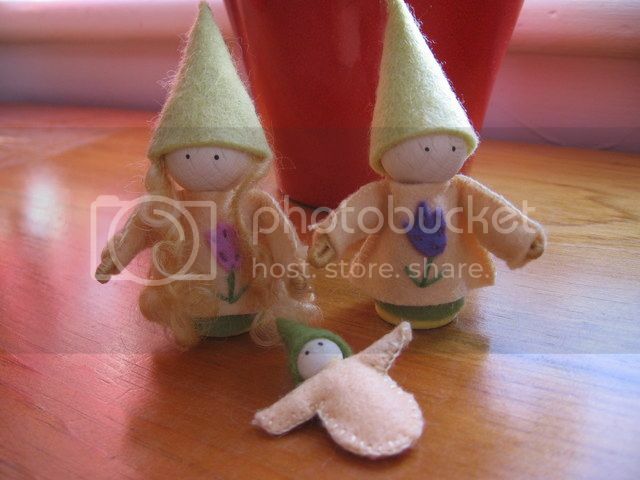 I am especially fond of her little animals, hand sewn from wool felt. Let's get to know her a little better. Tell us a little about yourself so we can get to know the person behind the work. I find it a difficult thing to sum myself up in a few words because I truly believe that I am still very much a work in progress. My focus in the now revolves around my three girls who are all in various stages of becoming the women they will be. During the quiet moments I find myself making things for them, my partner, myself and our home. My inspiration comes from the natural world. I enjoy creating things that highlight the world around us...whether it be the changing of the seasons, or the wonderful gifts of trees, sticks, animals and stones it brings forth. Many of our homeschooling days are spent wandering around the wilder spaces in our city and countryside and gathering supplies. How do you balance 'making' with mothering? As my girls get older I am finding that there is more time for me to create with the purpose of "stocking my shelves" so to speak. Most of my LittleWool creating still happens at night once the house is quiet(er). I also find that nothing passes the time while waiting up for my teenagers like needlecraft - needlefelting brings about particular satisfaction ;-). This week Karen is offering the set above, Mama and Baby Sheep. 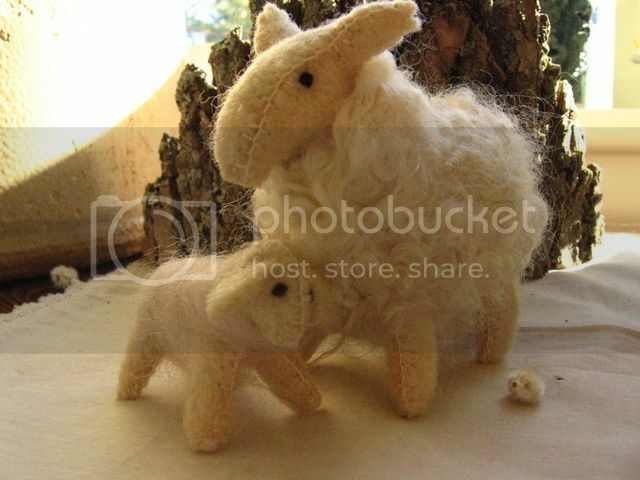 This Mama and baby sheep set is one of my absolute favorite toys to create. I was so excited after I created my first one, that I knew my creating journey was just beginning. I hand sew the sheep using linen thread, vintage wool blankets or sweaters and wool batting as the stuffing. Then I needlefelt wool locks onto the body of the sheep. OK, so to enter leave me a comment. You can let me know how your Monday is going or, better yet, tell me how you beat the dreadful Meltdown Monday or just say hi. I will randomly pick a winner on Sunday April 22nd and announce here, on my blog. (Please, make sure I have a way to contact you!) This giveaway is open worldwide. PS: If anyone is interested in participating in a Monday Meltdown giveaway, here on my blog, contact me here. Whether an item from your Etsy shop or just a little something you would like to give away to brighten someone's Monday, it's all good! This Monday was awesome because I went for a 3 hour walk with my babe and we didn't get rained on. She's teething quite traumatically right now and the motion puts her at ease. So, yay for a Monday of surviving teething! I went to the dentist. That wasn't the most exciting thing in the world, but the hygienist complimented me on my home care, so I feel like I got a win in the world today! Well, my barn roof is falling off the barn due to wind damage the week after my husband finally agreed to buy me a cow, and my daughter has a fever- there is always something to fret about if one chooses to. I choose not to! The cow will come next year, my daughter will be loved and rocked a lot. Super cute sheepies... shared on facebook here: https://www.facebook.com/Mama.Becca?ref=tn_tnmn#!/pages/Cedar-Ring-Circle-Waldorf-Buying-Co-op-Store/132737980116551. Thanks for the chance! the sheep are adorable! Today I managed to get most of a dress cut out for M... I have such trouble choosing fabrics. lol. Maybe I'll get part of it sewn tomorrow even. I beat the dreadful monday meltdown! Tuesday was more of a meltdown day for me! ): But Monday was nice. Relaxing! My husband is away on business for a few days and I survived the whole day with my kids without him. I hope that this is open to Canadians (if it states eligibility I couldn't find it, totally possible given my above statement, smile). I follow Karen via GFC (JourneysofTheZoo). I added her Etsy shop (JourneysofTheZoo). I like you on FB (JourneysofTheZoo). I also follow you via GFC (Journeysof TheZoo) and would appreciate a follow back. My monday is going great now that I ran across this giveaway! I love this set. This would be so sweet on my little Gwen's bookshelf. Thank you for the great giveaway! My Monday was productive. I decided to get a new front door and I ordered something finally and got some ideas about what colour to paint it. my Monday was cold and wet, it was raining all day over here. I love the 'wool locks' on your sheep - they remind me of a vacation we took to Scotland & all of the sheep we saw there. Thanks for the giveaway. meltdown mondays, eh? i spend them being kind to myself - whether that means a tea and a book at my local coffee shop, a yoga session at home or some crafting - that's the best way to combat those manic mondays. karen's sheep are wonderful! and to think i have the pleasure of working (occassionally) with such an incredibly talented, sweet, and down to earth woman! The weather in Virginia was gorgeous - making for a pretty wonderful Monday! Love the sheep! 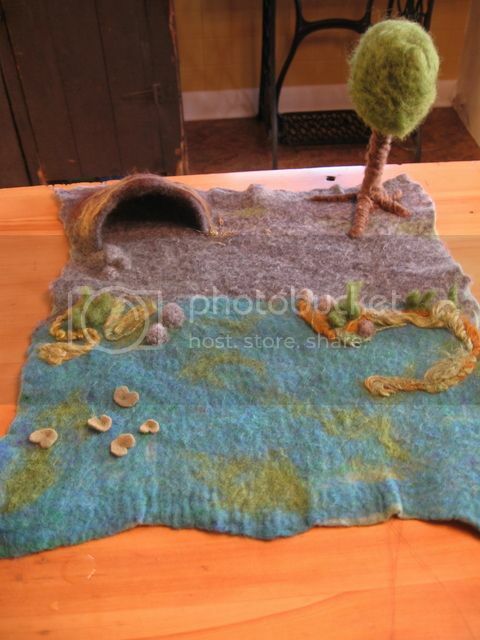 Beautiful Hand felted goods! Love the Mama and Baby sheep! My monday went great! Today however not so much. My daughter got her 1 year immunizations and was rocking a fever all day :( not fun! Spent yesterday (Monday) driving with my husband across Nebraska and into Wyoming. I get to hang out with him while he drives truck for a few weeks, while our almost 2 yr old son gets to visit with Grandma, Grandpa, Aunties, and cousins in WI. I miss him dearly, but I know he is having a blast, as are the rest of the crew! I spent monday working on some new items for my etsy shop. Monday is one of my most productive days! These sheep are super sweet... I beat the Monday Meltdown by being too busy to think about it! I just shared on Facebook as Tanya Rubezhov. I just blogged about this giveaway. I now follow Karen's blog with GFC. I Like This Cosy Life on Facebook as Tanya Rubezhov. Hi, it's looking pretty good & love all these. Added Etsy Shop to favorites. oh my!! i would love these!!! my friday isn't going so hot. my 15 month old was up at 3am (crying) & finally got her to sleep 5 hrs later--on my lap! its been a rough AM! Just found out I'm gonna be a grandma! Would love this for "Peanut"